Home Diseases and Conditions Why Do I Feel Hot but No Fever? Our bodies have a variety of responses to environmental, physical, and psychological influences. Our body may feel hot for a variety of reasons. Often, when we feel hot, we also feel as though we have a fever. Sometimes your body feels as though you are in the middle of the desert, but it is snowing outside. You may ask yourself ,”Why do I feel hot, but no fever is present?” We will discuss possible reasons and treatments for this unusual experience. Capsaicin, the chemical in peppers which causes them to feel spicy, may trigger your nervous system to feel as though your entire body is hot. Because of this, the body heats up to equalize the temperature of the body with the perceived temperature of the environment. Increased blood flow may result in sweating and flushed skin. This feeling may be lessened by drinking or eating foods that reduce the sensation. Drinking milk is known to be useful in diminishing the intensity of the spiciness. Some people place salt on their tongue. Others eat bread or crackers. These things balance or remove the chemical interactions that are burning your taste buds. Drinking water will not help with reducing the burning sensation, as water will only spread the chemicals around the mouth. You may also want to consume moderate amounts of spicy foods if the heat is causing you concern. Metabolism is the process that our body uses to consume nutrients, produce energy, and transport that energy to the cells of our body. People who have higher metabolisms may find that they are naturally warmer than other people. For some people, the question of “Why do I feel hot, but no fever?” may be answered by this simple process. 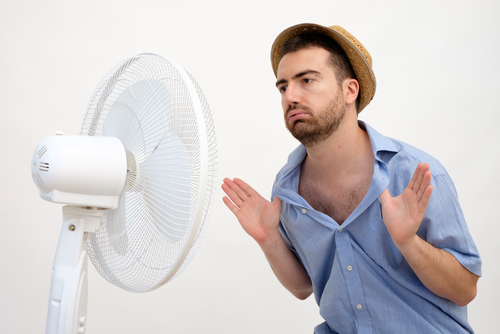 The associated heat sensitivity may be higher for some people than for others. People with high metabolisms may find that they sleep little, have excess energy, eat often or are thin. Avoid heat by moving into the shade. Drinking water will help regulate the temperature of your body. Wearing light clothes can also help. Exercise less frequently if you are able to do so. In general, keeping cool, drinking water, and moving less vigorously may help you maintain a cooler temperature. The gland that controls the temperature, metabolism, hormones, and other processes is located in the neck and is called the thyroid. An underactive thyroid the reason for a condition called hypothyroidism. An overactive thyroid is the reason for a condition called hyperthyroidism. For people with hyperthyroidism, they may find that their metabolism is increased, that their body temperature is raised, and other symptoms. People with extreme hyperthyroidism may experience weakness, sleeping disorders, high blood pressure, skin problems, hair loss and diarrhea. Hyperthyroidism should be treated with a medical professional. Medication and multi-vitamins may be beneficial. Dietary changes will also diminish the severe effects of hyperthyroidism. A blood test administered by a medical professional can determine the status of your thyroid. It is important to care for your thyroid, as it is one of the most important regulatory glands of your body. If left untreated, major medical concerns can develop. Ovulation is the time that the female body prepares for pregnancy. Progesterone and estrogen, the hormones that determine and regulate the female reproductive system, cause a variety of hormonal changes. As levels of progesterone increase, so does your body temperature. Additional signs of ovulation may be silky cervical mucus, soft or opening cervix, pulling sensations in your lower pelvis, nausea, and other sensations. If you find that you experience problems with heat during your ovulation, then take action accordingly. Dress in lightly clothing that will allow your skin and body to breathe easier. Perhaps keep a fan available for you to cool down your body with. Additionally, be sure to keep hydrated, as water and other cool liquids will support your the natural regulation of the temperature of your body liquids. During pregnancy, the body increases blood volume to properly care for and bring nutrients to the developing child. At this time, the body has half again as much blood as the body did before pregnancy. This extra blood, and the energy that it takes to support a developing child to cause you to feel warm. Fatigue, nausea, dizziness, increased heart rate and other symptoms of pregnancy will be present. As always, it is important to take care to drink extra fluids. This will not only help to reduce the heat that is experienced, but it will also support the child. Dress lightly while pregnant to better remain cool. Additionally, it is perfectly acceptable and entirely beneficial to take rest breaks throughout the day. If you are pregnant, then it is important to care for your body to care for your child. Hot flashes are a well known symptom of menopause. These hot flashes can leave women think, “Why do I feel hot, but no fever?” As hormone levels change at the conclusion of the reproductive system. During these changes, the hypothalamus, which regulates the temperature of our body, causes our temperatures to increase. Other symptoms of the early stages of menopause may be irregular periods, sleeping disorders, weight gain, sweating, and other uncomfortable sensations. If you find that hot flashes become common and cause you great discomfort, then make an effort to care for your body. Drink extra fluids to keep your body hydrated. Fans during the night may help night sweats. Carrying a fan while you are out of the house may help. Using a cool, damp cloth during extreme hot flashes. During periods of stress and anxiety, our body releases a chemical called epinephrine. Epinephrine dilates the blood vessels, so additional oxygen can flow through the body. This is because our body is preparing for action and needs energy. During this time, we often feel sensations of heat, flushing, sweating, tightened muscles, and other similar symptoms. Reduce stress in your life and minimize the your exposure to stressful situations. If you live a life where you are unable to remove yourself from these situations, then practice techniques that reduce stress. Anxiety manifests itself as concerns and worry about future events. Living in the moment, meditation, yoga, rhythmic breathing, naps, and relaxing in the shade may help reduce stress. If the stress that you are experiencing is caused by a person, then speak with them about your concerns and needs. If your life and lifestyle is the root of the problem, then determine what changes that you are able to make. If memories, regrets, anxiety or worry are the problems, then attempt to live in the present moment. Next articleIs Sparkling ICE Good for You?